The WFTDA Division 1 playoffs are here! Starting in Tucson, Ariz. this weekend, and continuing for the next three-out-of-four weeks, the top 40 teams in the WFTDA will play for 12 spots in the Division 1 Championship bracket. Four of those teams—the four winners of each playoff weekend—will get a one-game bye. While we have to get through the rest of the month to see who those teams will be, we already know the first four WFTDA Championships entrants. Nashville, Kansas City, Demolition City, and Sacred City are all in with a chance to play for the Division 2 title in Minnesota, having all reached the final of the divisional brackets in Cleveland and Detroit. Nashville will face Demolition City; and Kansas City, Sacred City, with the winners of those two games playing for all the marbles on November 8. What happened in the Division 2 tournaments may give us a few clues as to the quality of derby that we could see in Division 1 this year. The trend in penalties is something else to keep an eye out for. Big increases in Forearm (12.4 per game, +47%) and Direction of Play (12.2 per game, +49%) calls helped contribute to an overall 13% increase in Division 2 penalties. 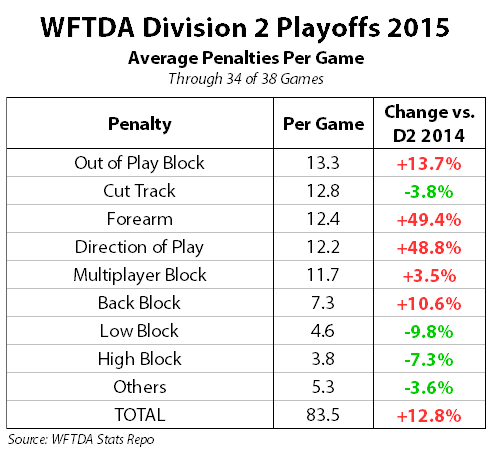 That’s a bit troubling going forward, considering D2 had fewer penalties called per game than D1 did in 2014. If this trend holds, we may be in for a lot of sloppy, whistle-heavy games over the next few weeks. Despite that, we should still be in for a handful of really close games, too. Many of the teams coming into Tucson have previously faced each other in tight contests, and the brackets are lined up in such a way where it is very likely they’ll meet again with something more on the line. WFTDA.tv continues its tournament coverage with the PPV webcast. The higher quality of play in Division 1 means a higher price to pay to see it happen live, so a single streaming pass will set you back $15. (The live audio feed is free.) If you are planning on watching all the remaining WFTDA playoff derby from here on out, you can optionally purchase the 5-tournament streaming package for $60. It’s like getting Champs for free! Here are the ten Division 1 teams you’ll be watching hit the track in the Arizona desert this weekend. Australia’s finest flat track roller derby team has been making waves in 2015 with their stifling defense. In four sanctioned games this year, all against opponents with the potential to advance to Championships, VRDL has only given up an average of 102 points. Given the teams they were facing, that’s pretty damn impressive. Making the trip to the United States to test themselves against the WFTDA’s best, VRDL first ran into #13, Atlanta, who was no match for them in 141 point warm-up win. The big tests happened at The Big O in early May, where they went undefeated. Victoria beat #7 Texas by 70 points, #6 Bay Area by 27 points, and #5 Denver by 35 points. That experience against Bay Area will be crucial in Tucson, since B.A.D. is the #2 seed this weekend. Victoria should cruise into the final, but there’s a good chance they’ll have to get past Bay Area again for the all-important bye at Champs. The Golden Girls have not had the best of years, and in fact are coming into the playoffs on the wrong foot. The most important thing to know about Bay Area is simply this: All six of their losses in 2015 were against opponents ranked alongside them in the WFTDA Top 8. Those last two losses, versus Texas and Angel City, were especially sour. Even at home, hosting its annual Golden Bowl tournament, it still couldn’t win against teams ranked below them. That’s not what you want to see when you’re only days away from the most important games of the year. Maybe Bay Area caught a few bad breaks along the way, sure. That can happen with games that close. But if this team wants to turn things around and come out of Tucson with a bye, it’s going to need to string together two perfect games on Saturday and Sunday, given who they’ll likely face. Unless you’ve been living under a rock for the past couple of months, there’s no way you could miss Arch Rival’s thorough whiplashing of the middle tier of the WFTDA. Ending 2014 with a respectable rank of #23, Arch tore through anyone and everyone near them to jump up to #11 in the WFTDA, collecting an obscene 210 WFTDA ranking points along the way. The scenes of the crimes, and the victims: Skate to Thrill, April 2015; #31 Arizona, #39 No Coast, and #48 Naptown. Spring Roll, May 2015; #65 Calgary, #24 Dallas, #32 Toronto. Midwest Brewhaha, June 2015; #34 Ohio, #29 Steel City, #12 Minnesota. That’s a lot of big wins against some pretty quality opponents. (The team’s only blemish of the came just a month ago, a 193-112 loss to a very strong #9 Jacksonville.) The Minnesota game in particular, a 169-133 final, is an excellent sign that Arch Rival is primed to make its first-ever WFTDA Championships appearance. Watch out, though! Of the games that were close, one was a 180-142 win at home over Team United, the first opponent Arch Rival will face this weekend. As long as they don’t trip up there, they’ve got a decent chance to beat likely foe Bay Area in the semis—better than 1-in-3, according to Flat Track Stats. Rocky played a very similar schedule to that of Bay Area and its trek through the top of the WFTDA. Looking at the results, you can see just how wide the rankings gulf is between the top teams—even though Rocky Mountain is itself a top team! 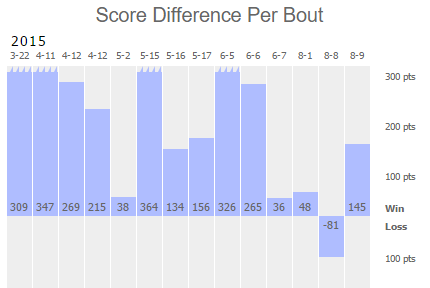 Score differences like these mean Rocky’s chances of making the final game this weekend, which would require them getting through #3 Victorian (should Rocky also get through their opener), are slim—and probably none. This means it’s a likely going to be a fight-fight-fight for third place, probably against either Bay Area or Arch Rival. Speaking of Charm City and Rocky Mountain, these two teams have a bit of history. Last year at the Salt Lake City D1 playoff, the two met in the 3rd place game. Rocky never trailed en route to a 183-156 victory. When the 2015 brackets were filled, you can bet your bottom dollar that Charm City had a rematch in mind. Charm’s regular season hasn’t been particularly noteworthy, however. They had a win over #20 Windy City, 272-126…though with how the bottom has fallen out from the Rollers this year, that’s not really a good game to bench Charm against. Perhaps more telling are the results, the losses, against other highish-ranked teams. #10 Philly, #12 Minnesota, and #16 Montreal all beat Charm City by similar margins, clearing them by 188 points on average. A 210-147 loss against #17 Stockholm was better, but not a result telling of the team’s ranking. Nor was the 135-121 loss Charm suffered to #23 Boston. It’s understandable if you can’t beat nearby teams ranked above you. But you’ve at least got to beat the ones ranked just below you if you want to come into the playoffs with some level of confidence that you can win the important games when everything is on the line. Team United quickly made their way through the WFTDA Apprentice Program, graduating at the end of last year. Since then, they’ve proven they are ready for the spotlight in the Division 1 playoffs. United has also shown it knows how to schedule well., with all but one of its 2015 games featuring mostly-competitive scorelines. Their closest game was against #39 No Coast in March, a 162-153 win. (They also beat Windy City by 15 in an unsanctioned game.) United repeated the feat with a 49-point win over No Coast in June. In a pre-playoffs tuneup, #21 Detroit KO’ed them 196-153. But the most telling game, as mentioned above, was the 38-point loss against a crazy-good Arch Rival. One can’t shake the feeling that Arch Rival wasn’t playing their best during that contest. Of course, you also can’t discount Team United’s role in getting that close to a team that tore through opponents that aren’t too far off from where United is right now. A first-round upset is certainly doable—but it would certainly be an upset. UNBELIEVABLE. UN-FREAKIN BELIEVABLE!!! TCRG EEKS OUT A 1 POINT WIN 172-171 OVER SEATTLE! YES I'M YELLING!!! A stunning result, seeing as Terminal lost to Rat a few months before at Besterns, 180-85. This is a strong indicator that this team is punching above its weight coming into Tucson—though only strong enough to peak with a potential 5th place finish this weekend. For them to compete for a top 4 placing, it would first have to beat fellow Canadians Tri-City, then get through Bay Area on Friday night. Bay Area has already beaten Terminal this year by over 200 points, as have the other four top opponents Terminal has faced. This includes 4-seed Rocky Mountain, who has a 175-point feather in its cap. Flat Track Stats has Arizona ranked #54 in the WFTDA, which is the lowest of the teams playing this weekend and one of the largest WFTDA/FTS rank discrepancies of all teams in the Division 1 playoffs. It’s won more games than it’s lost in 2015, but those wins were pretty much all against teams that were in the Division 2 playoffs. That would be fantastic if Arizona was bound for the Division 2 playoffs. But they ain’t. Instead, the WFTDA diverted them to nearby Tucson. (Literally; AZRD was one of the teams that swapped playoff sites.) Full credit to the Terrors in taking on the big teams—Rat City, Denver, Angel City, and we’ll count Arch Rival, too—but that level of competition apparently didn’t do much to help. In late July at RollerCon, Arizona faced #24 Dallas in a a 243-99 loss that doesn’t bode well for the level of competition probably awaiting them down in the consolation bracket. The games the Dairyland Dolls have played can be put into two categories: Blowout losses against top-ranked opponents, and competitive games against near-ranked opponents. The blowouts weren’t anything out of the ordinary given the ranking gaps, which came courtesy of #9 Jacksonville (413-64), #13 Atlanta (373-79), and #18 Tampa (265-139). On the competitive part of the spectrum, they split a home-and-away with Windy City (-7 and +26 points); and had further losses against #42 Santa Cruz (-38) and #21 Detroit (-24) at Midwest Brewhaha. These games are more recent, and therefore more relevant data points. In the end, though, Madison has just one win on the season. They’ll be looking to grab more than that this weekend, drawing a good first opponent in the way of Arizona. Flat Track Stats gives Madison a 3-to-1 edge in their game. When you’re one of the last teams to make the Division 1 playoff field, you’re just happy to be there. The 10-seeds have it nice, in a way. It’s impossible for them to do any worse than where they started the tournament in! Tri-City can relate to this. In 2014, it came in to the Salt Lake City D1 tourney as the #10 seed, and won their last game to finish 9th. If they hope to end their season on another positive note, it will have some work to do. The highest-ranked opponent Tri has faced was #34 Ohio, which is only one seed group ahead of it. That March game ended badly, however, with Ohio winning 257-122. The team’s other losses were against D2 Detroit 6th-place finisher #52 Chicago Outfit (-86) and fellow Division 1 10-seed Rideau Valley (-30). Those results don’t give them much to grab onto, in terms of their chances of improving in the tournament. But hey, you’re guaranteed to at least do as well as finishing where you started! That’s already better than the other nine teams playing this weekend. Last year, Detroit (the team) was severely underranked, blowing out everyone in Division 2 on their way to the title. No overpowered team this year helps explain why the average gap is lower, but not why the median or number of close games isn’t as good as it was last year at this point. The four D2 games at WFTDA Championships should bring the numbers closer to where we would expect them to be, however. Also: A 308-68 loss to MRDA #1 Your Mom, which just happened last weekend.